Respect. This is the main thing my father taught me growing up. To respect everyone as human beings. I followed his example. I hope to teach my kids the same through my actions/beliefs. Kids are like sponges and they pick up stuff. The main thing I try to show them by living my life is to always respect and help others, to always look past outward appearances. Discrimination, stereotyping, racism is everywhere. I don’t get how people can’t see how simple it really is. If you are a human being, I don’t care whether you’re older, younger, white, black, in a wheelchair, deaf or watch Big Brother…you are a soul and deserving of love and respect. Always. Unfortunately words are powerful and they are tossed around casually. Sometimes they do indeed hurt others. I think it’s the intention behind the word that matters, too. Some words that might offend you, might not offend others. So we do need to be careful. I think the best all of us can do is to practice being more open to each other’s backgrounds and beliefs and to be kinder. More empathetic. And respectful. Yep, yep, and yep, Darla. Forget about imaging world peace… imagine world respect. THAT would change everything. And with respect comes the freedom to disagree. Respecting someone doesn’t mean you believe in everything they believe – it merely means you accept their belief and will not judge them for it (so to speak). Smiling and nodding goes a long way, even if you don’t agree with what is being said at the time. Hilarious! I may not be the brightest bulb, but I am bright enough to know you lean more towards Rob’s feelings of reality television. 😉 So. Will you be watching tonight?! No doubt, eh? Lack of respect. It is rampant in this culture. It occurs within ethnic circles, as if insiders didn’t have enough pain to endure. What that rough, disrespectful language does within an ethic group is desensitize individuals so that they can’t be hurt from the outside. I get that. But it does NOTHING to help them help each other gain self respect. Nor does it help outsiders to treat and think of them with respect. But it is not just there. Lack of respect is BLAM in our faces on TV, radio, FB, Twitter, billboards. I can’t bear it. I refuse to watch network television anymore and it’s been years since I’ve listened to commercial radio. At least on FB and other social media outlets I can filter and I can step forward to offer a counter-view. Just look at Congress for a model of closed ears, open mouths, and no respect governing the process. Thanks for the welcome, Linda. I appreciate your visit after all this time. I really believe the culprit in society is less racism and more lack of respect – perhaps color it a lack of respect for someone’s upbringing, way of life, style, etc. – still, I paint it more as disrespect than racism. Alas, that comes from a white woman. And yes – our gov’t doesn’t always show the best example of how to get along. Then again, the gov’t was created for the people by the people, so we have to start with us – to see a change in them. I agree. I didn’t mean to paint this in a racist bubble. But to point out the inside out destructiveness of allowing disrespectful language to pervade even within groups who are struggling. But, I understand how that happens…as a result of outside ostracism and the horrible things that people endure. Together, I think they try to built a collective thick skin, but it backfires and only escalates the lack of respect. I think I’m not making sense. Sorry. We need to be respectful everywhere, school, work, politics, on the road, in the media, with our friends and with those who might never be our friends but we share a planet with them. And what’s so wrong about wearing socks with sandals? Maybe it’s because I live in the Northwest, where people wear Birks and socks with regularity. Or because when I was pregnant, my feet swelled to the point where I was able to loosen the straps on my Birkenstocks and wear wool socks with them in November. No judgment here. First off, so great to read your thoughts again! Yes, there is a dearth of respect these days. I’ve always tried to treat my son with respect as he’s grown up, and he is respectful (age appropriate) in kind. He learns a lot by modeling. One thing that has always bugged me (as much as racism) is treating children with a lack of respect just because they are young. They are little sponges and learn more by what they live than by what they are told to do (especially if there is a conflict between what they are told to do and what they see going on around them). I’ll get off my soapbox now. Welcome back! Soapbox? Soapbox? I didn’t see no stinkin’ soapbox. I agreed with every word you typed. And, I appreciate the welcome back, Susan. I’m not really back – but I had to get these thoughts out. I am so way behind on reading your posts, too, and I apologize. At this point, I doubt I’ll go back to the point I stopped – but I do hope to read again soon. Seriously. Thank you for visiting in spite of my long absence and lack of reciprocation. No worries! I am spending the summer sitting, healing a broken foot and torn tendon. Just had surgery, and I am healing. So, that’s all the excitement around here. Hope your boys are having a good time this summer. If I didn’t already like you and i read this, I would like you even if you wore your socks over your sandals. You’re swell, Oma. 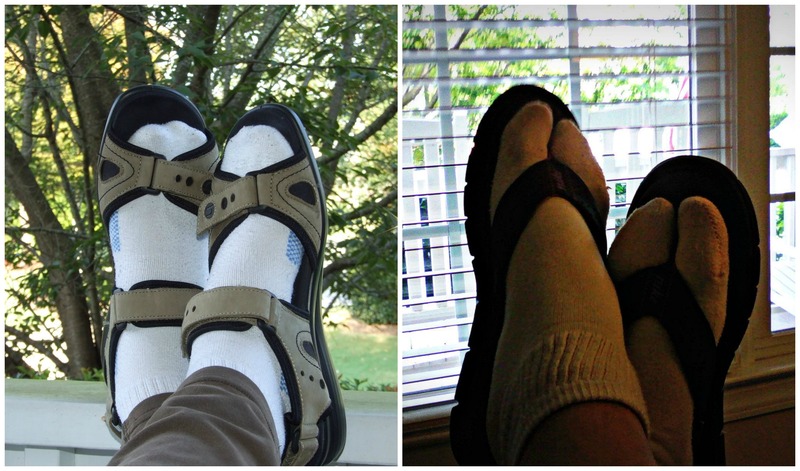 I might have to try the “socks over sandals” thing. Maybe THAT will become a style common on the fashion stage in Paris. There is lack of respect for those trying to enforce the law, too. When did people learn to speed away rather than pull over to the side of the road when those blue lights flashed behind them? Yes! The boy and I experienced that this morning, Patti. A ladder truck and ambulance were trying to get through an intersection. It saddens me to see folks not pull over. One day – their life might be the one on the line. It’s not just social media, but I think very much the way that we can tune our “feeds” to match our worldview. If I’m liberal or conservative, or green, or gun, or whatver… I have “news” networks that will cater to me and twitter feeds that will feed me things I like to hear — almost always from a polarized viewpoint. This lack of actual counterpoint and thoughtfulness makes anyone that disagrees with us “other”. We’ve lost the capacity to allow someone else to have a viewpoint that deviates from our own. Well — there’s a “treat those as you’d be treated” axiom here. A call to rise above the meanness and the polarization — and that even when you get it, you don’t return it. Or.. do unto others as you would have them do unto you?! Hee, hee. Yes, there is a lack of respect and this certainly goes a long way towards some of the underlying problems across the board. But I would say to some extent it is also a lack of respect for historical context. Yes, Valentine. I think more “history” needs to be taught not only in the classroom but in the home, as well. This is something I’ve been thinking about a lot lately. Not because of Big Brother, though. Never seen the show, although I did see them go back in time (har) last night while flipping channels. No, Survivor more than handles of all my reality needs. Then I retreat safely back into my own little world. I heard about the racism incident on Big Brother, though. It was big news. I learned recently of an experiment where resumes were sent out. Those with “black sounding names” were 50% less likely to get a callback. I love simple experiments like this that expose the way things really are. We may think we have come a long way but we still have such a long, long way to go. I’m currently reading The Help. It’s not historical canon, but some of the stuff in there really blows my mind. I knew there was/is racism, but even I underestimated the disgusting way humans could treat each other. The things in that book make me feel naive and I always claim to know the true nature of the universe. Sometimes there is peace in being naive – you know, the whole ignorance is bliss thing. Alas, sticking your head in the sand and pretending not to see it doesn’t fix it. It’s more than black and white, though – far more than black and white. In my opinion, anyway.